The best time to visit this bulb bed is from March till May and October. From March onwards the autumn flowering bulbs are in full flower. 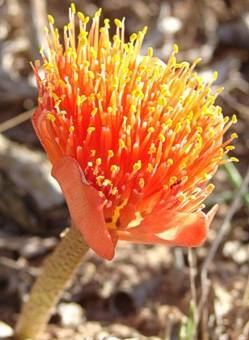 The spectacular flowers of Brunsvigia, Amaryllis and Haemanthusspecies transform this otherwise barren landscape into a brilliant field of pink and orange. In late spring it’s the bright pink and purple flowers of the watsonias that give colour to this section. The orange-red flowering paintbrush, Haemanthus coccineus, the March lily, Amaryllis belladonna, the kandelaar, Brunsvigia josephinae, and the gifbol (poison bulb), Boophone disticha, are displayed in this bed. More amaryllids are displayed in the bulb bed on the other side of the karoo beds.